We were in the midst of our 2018 Winter Festival when we were asked to take part in a film produced, we were told, in honor of Ivry Gitlis’s 95th birthday, which would be celebrated in Paris in January 2019. We did not hesitate for a moment: Ivry, one of the most internationally famous violinists of the second half of the 20th century and the early years of the 21st, has accompanied Keshet Eilon from its inception and taken part in a large number of its activities. Whenever he came to Keshet Eilon, he was invariably surrounded by young string musicians eager to hear from him not only about his ties to the world’s greatest performers and his warm relationship with Israel, but also about his philosophy of life and interpretation of music. 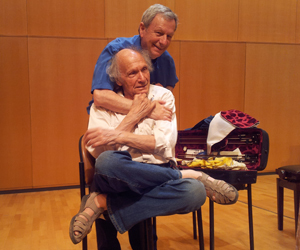 His well-developed sense of humor was an added attraction – and, of course, the youngsters all wanted to enhance their CVs with a mention of participation in a masterclass with Ivry Gitlis. In the film, which you can see here, Vadim Gluzman and Angela Yoffe, prominent musicians who were once students at Keshet Eilon, offer Ivry their congratulations. What you cannot see, but which is no less important, is that all of us at Keshet Eilon likewise join in these warm good wishes. The film’s initiator Michal Gilad described the background to its production: “My father, Muli Gilad, is Ivry’s cousin, and they were always very close. Perhaps because of this, Ivry was like an uncle to me. Whenever I went to visit him in Paris we used to talk about what action might be taken to improve the situation in Israel, and this was a bond that connected us very strongly. Ivry loves Israel very much, and the film stems from a desire to express this connection and this love. What did the work involve, and how long did it take? The main problem was that we had to do it at a time when all Europe was on holiday. It wasn’t easy to organize everything that had to be done during a period when no one was working, and this meant that we had to postpone everything until almost the very last moment, and this caused a lot of tension. The fact that the film was made as a surprise for Ivry also complicated things a bit, but in the end all’s well that ends well: the film was shot, edited and issued. Has Ivry already seen it? How did he react? It came as a great surprise to him, and he watched it a number of times. As he watched he reiterated his love for Israel and stressed how important the country is to him.